It’s finally here. My new book, book two in the Brilliant, Minnesota Series, will be released on November 21 and is available for in print on Amazon and soon at BarnesandNoble.com, and for pre-order on Kindle, Kobo, Nook and other venues. It’s Christmas in Brilliant, Minnesota, and Brilliant is known for its glitzy Christmas traditions. A world-renowned Christmas pageant, the town square decked out with Santa’s Village and a live nativity scene bring visitors to Brilliant each year. Just as the tourists arrive, Jezabelle Jingle and her mystery writer friend, Miranda, find the body of Ernest the elf dead and wrapped in a bundle of Christmas lights in the town square. Is Ernest part of a new holiday puzzle the Discombobulated Decipherers need to solve? Or is dead Ernest part of a bigger plot? Will Jezabelle decipher the clues so Brilliant can celebrate Christmas in peace? Or will Jezabelle be the next gift-wrapped box under the village tree? Here is a little about me in case you haven’t investigated my website. As human beings, we are always a work in progress. From birth to death we live, hurt, laugh, cry, feel, and with all of those emotions we grow as people, as family members, and as friends. I am a dreamer and feel blessed to have the opportunity in my writing to pass those dreams on to others. I believe you are never too old to dream and to turn those dreams into a creative endeavor. I live in rural Minnesota and I am a wife, mother, and grandmother. I have worn many hats throughout my life such as working as a waitress, nursing home activities, office manager and finally computer repair person eventually owning my own computer repair business. I never forgot my love of writing and quit my computer business in 2012 after signing a contract with Cozy Cat Press for Granny Hooks A Crook, the first book in my Fuchsia, Minnesota Series. 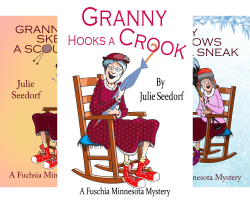 Adding four more books to the Fuchsia Series, adding a new Brilliant, Minnesota Series and writing a column for local newspapers feeds my writing creativity. I also dabble a bit in watercolor painting and hope to eventually add pictures to my children’s book series, Granny’s In Trouble. Oh, and did I tell you I like to be a little bit silly. Now if you haven’t read the first book in the series The Penderghast Puzzle Protectors, I would recommend you buy it now so you can get the history of Brilliant and the ever-changing Penderghast Puzzle Protectors who turn into the Discombobulated Decipherers in the second book. It’s only .99 on Kindle, a free read on Kindle Select, or if you prefer the print version it is also available on Amazon, BarnesandNoble.com, It is also available in Audiobook. Thank you for your patience and happy reading. Make sure you comment as I will give away a Kindle copy of The Penderghast Puzzle Protectors to prepare you for the Discombobulated Decipherers. And make sure you tell your friends.